Lanyu was the most unforgettable place I visited on my journey around Taiwan. 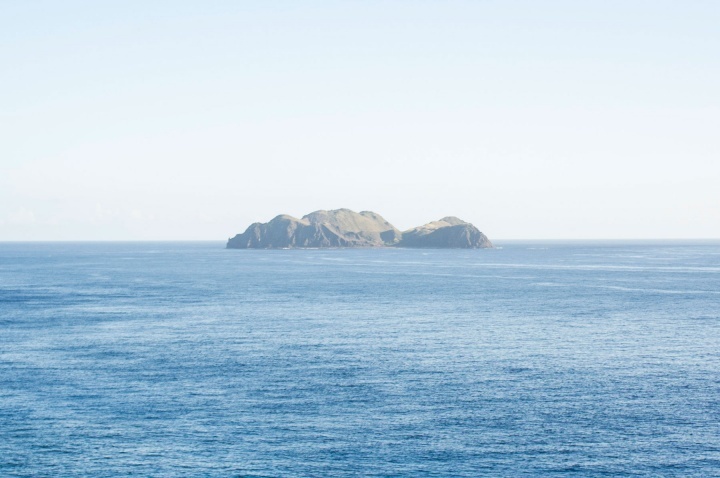 This island isn’t as black and white as it might seem at first glance. 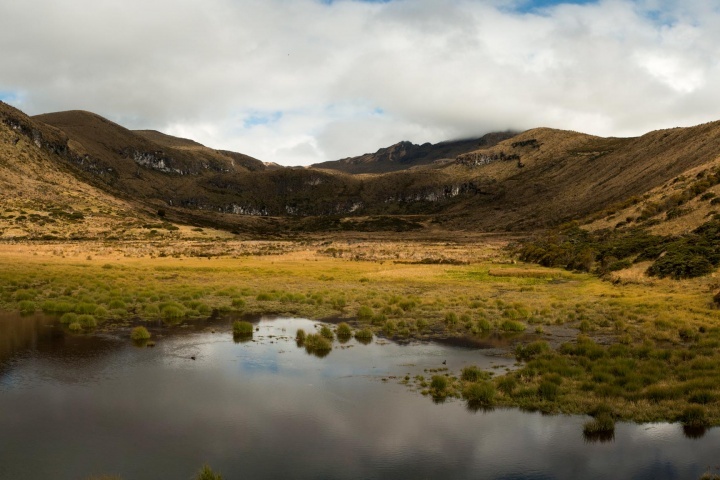 Sure, tourists come here to eat flying fish and go scuba diving, but look beyond the island’s hypnotically beautiful mountains and you find hidden political and social issues. 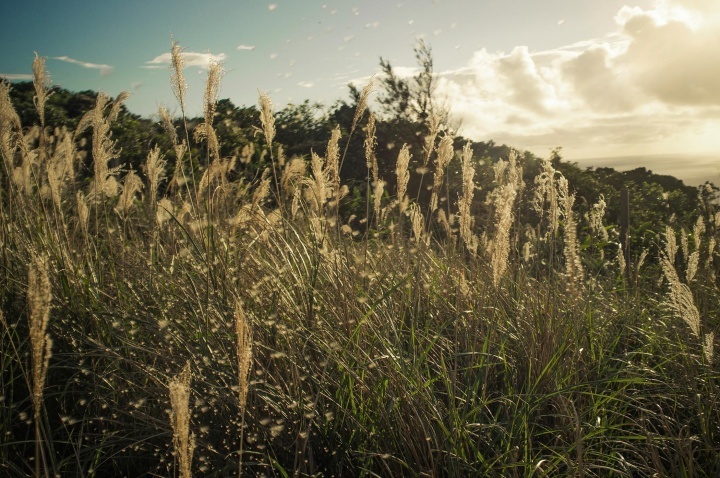 This is my photo journal of a visit to the Island of the People. There are two famous islands in the south eastern part of Taiwan – Lu Tao which literally means Green Island, and Lan Yu, which translates as Orchid Island. The first is easily accessible, so I chose to travel to the second one. 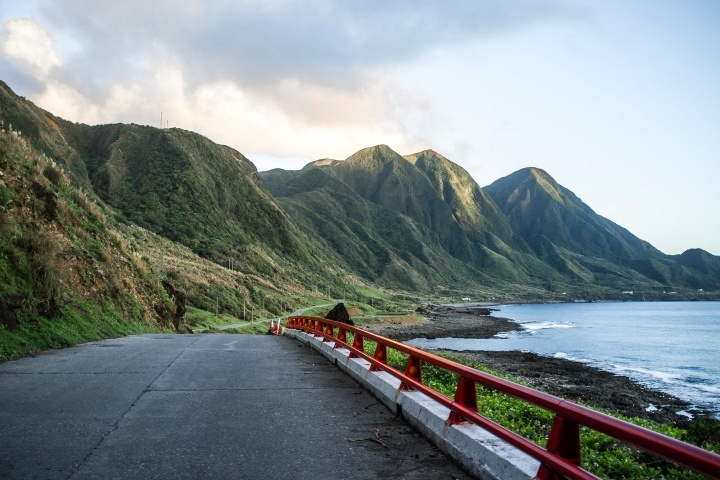 Lanyu was given its name by the Chinese government after WWII, due to the orchids found blossoming everywhere on the island at the time. 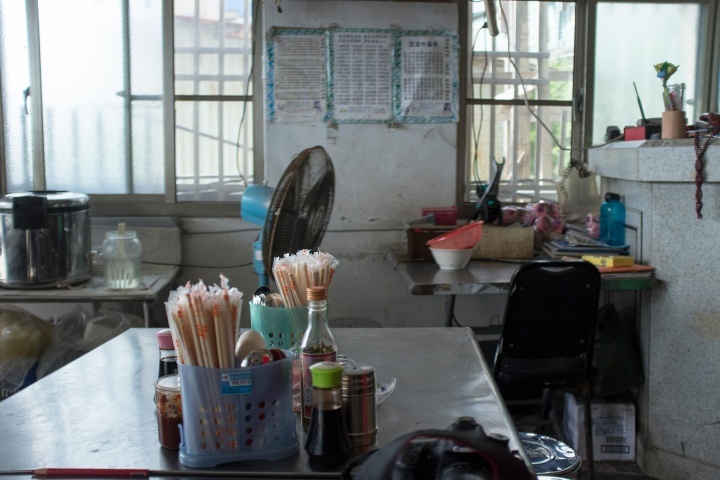 However, the locals still call the island Ponso no Tao, which means Island of the People. Lanyu has a smaller brother. Little Lanyu, Taiwan. 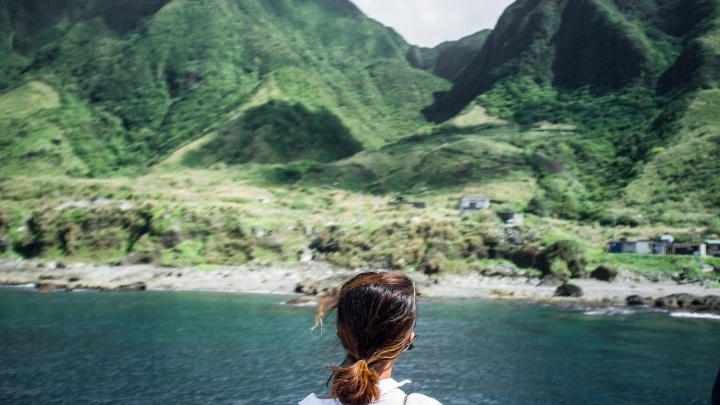 Flights and ferries to Lanyu are often cancelled during the typhoon season, but this particular day was just perfect. I left my hostel early in the morning and was one of the first to arrive at the port. 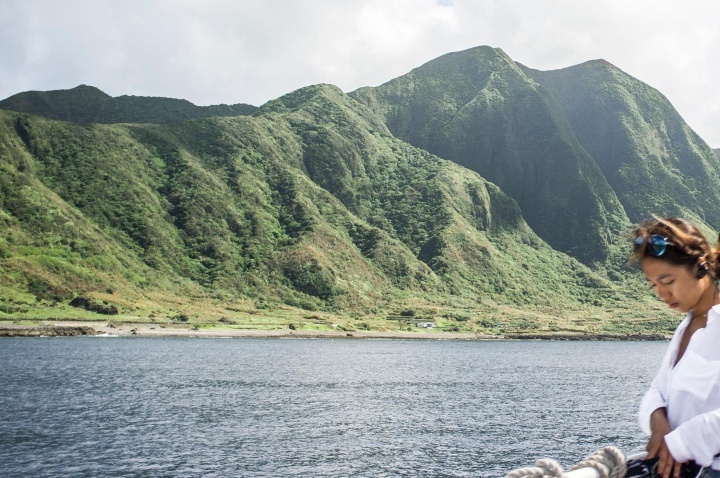 During the off-season the ferry between the islands operates only twice a week, if you miss it, you have to wait at least three days for the next one. On the journey to the island I was lucky enough to see flying fish, which had always seemed like a myth to me. Cutting through the rippling waves with their tails, the fish cleared the way for the passing ferry. There were also dolphins following our boat, like the opening scene of some film. I was so awestruck by the view out of the window that I completely forgot to capture the action on camera. 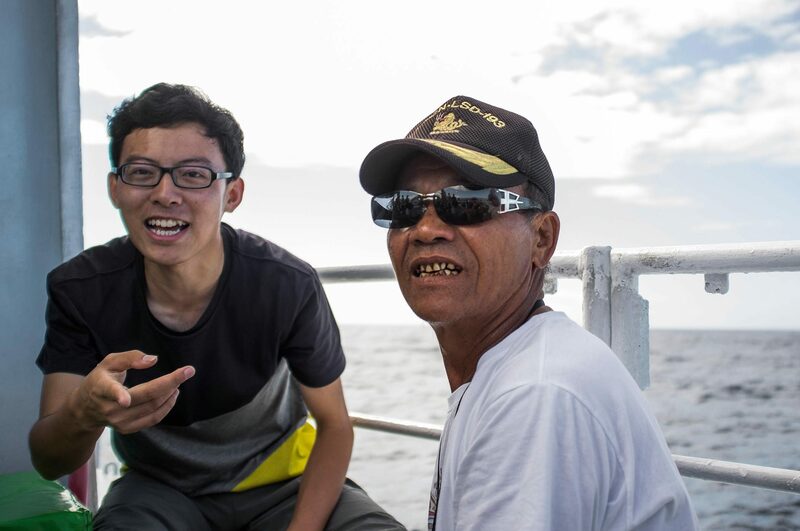 A Chinese tourist and a local Tao man, with red-stained mouth and yellow teeth from chewing betel nut. 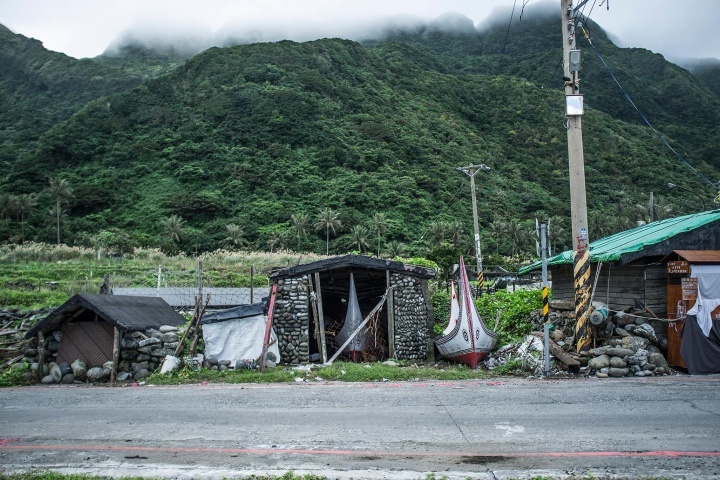 Members of the local tribe, as well as many other Taiwanese, chew betel nut for its stimulating properties. It’s sour and bitter in taste and very juicy, producing an excess of orange liquid that chewers then spit out. What the locals might not know is that it causes cancer. The island loop road and a rugged peak welcome the ferry ashore. 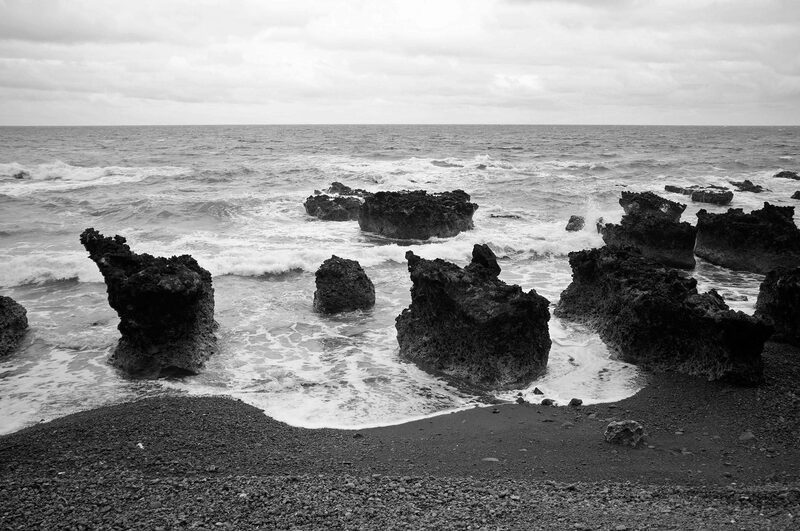 The three hour trip from Taitung may have been bumpy, but I felt lucky to arrive at all. Locals told me that we were visiting the island at the wrong time of year, as strong winds and heavy rain are common during the winter here. But, on this particular day I was lucky. 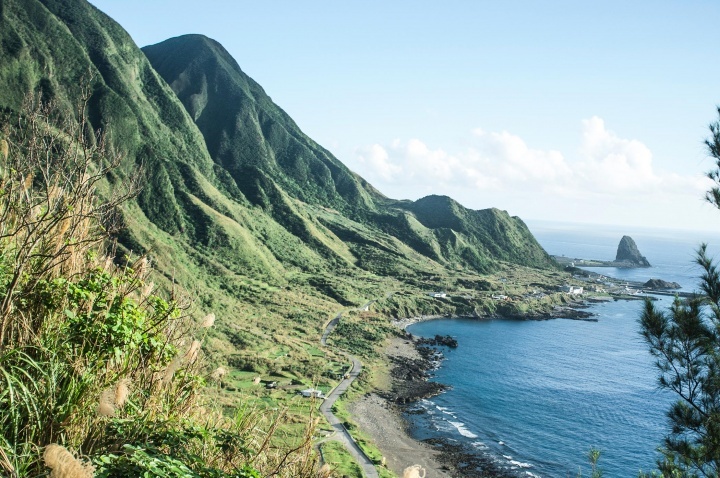 Lanyu is one of the few locations in Taiwan that has remained relatively untouched by pollution. It’s also a wonderful place to lose yourself for a few weeks or even months and bask in the island’s peaceful and relaxing atmosphere. There are no busses on the island, so the best way to get around is by scooter or bike. 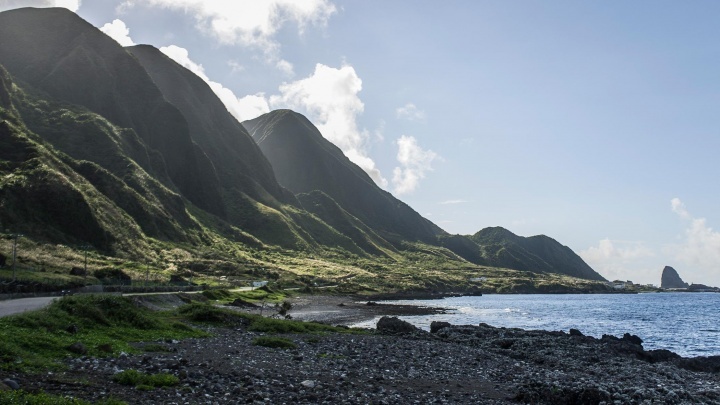 There are only two roads – the loop road which circles the island, hugging its coastline, and the mountain road, which cuts the island into west and east. The loop road is about 40km long and connects Lanyu’s six villages. There is only one gas station on the island. Hilltop view over a typical Lanyu village. 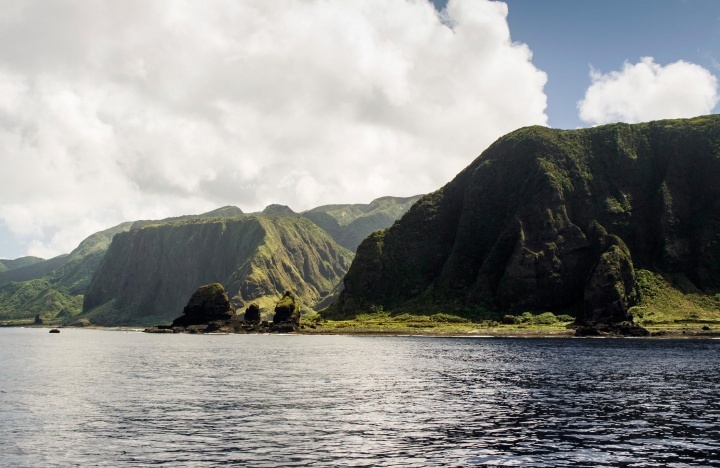 On my journey around the island I encountered spectacular caves and magnificent volcanic rock columns, formed by lava, protruding from the deep blue waters. I wasted no time in jumping on a scooter, coasting along the main road and gazing in awe at the array of geological wonders, remnants of the island’s volcanic activity. Known by its Chinese name, wǔ kǒngdòng (five-hole cave) on Lanyu is a popular geological site. It’s steeped in a mysterious religious atmosphere. The vast interconnected caves are adorned with crucifixes erected by local churches and contain skeletons, making them look like they’re part of a pagan sacrifice ritual. 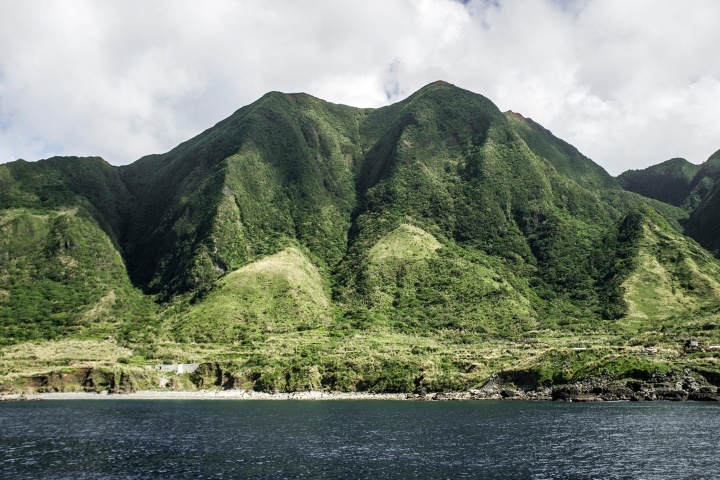 A scenic road bisects the island, reaching to the top of a mountain. The road runs all the way to the weather station atop the central ridge and opens out over an amazing view. I was moving fast on the scooter, trying to stay upright and avoid hitting a wild goat. The winds were strong, blowing straight in off the ocean. 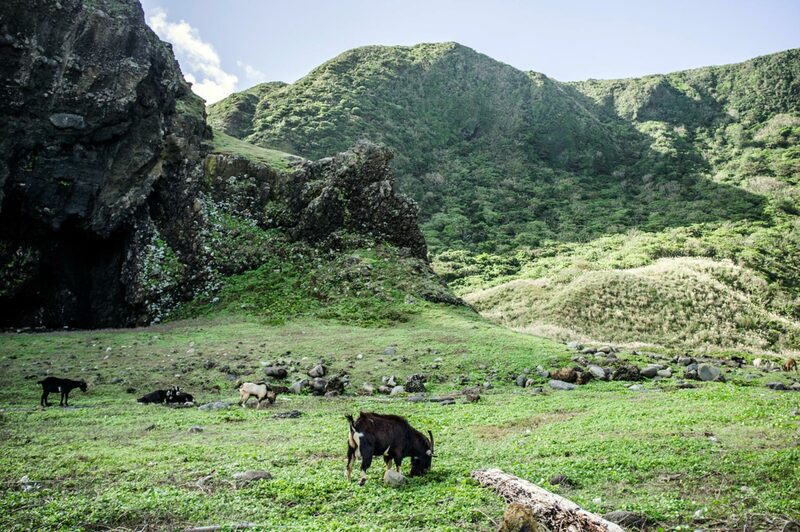 Lanyu is famous for its fauna, such as wild goats and pigs. 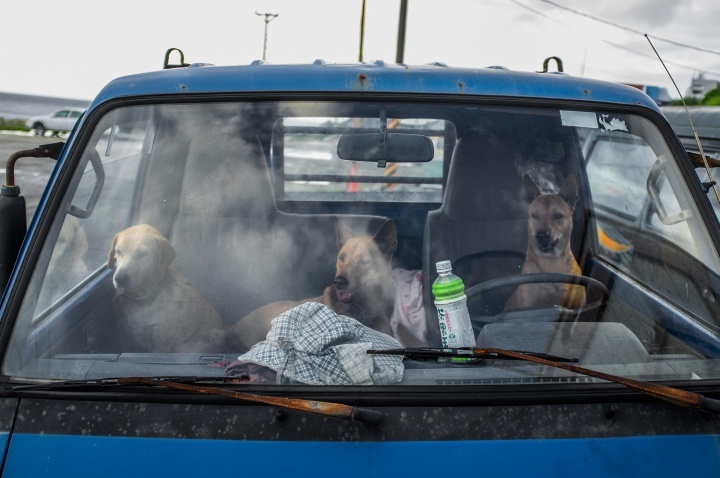 These animals have remained wild here and are not bred by the locals. The Tao people regard a free-ranging herd of goats as a symbol of wealth, and do not breed them on their land. Consequently, they can be seen everywhere, from rooftops to cliff edges. 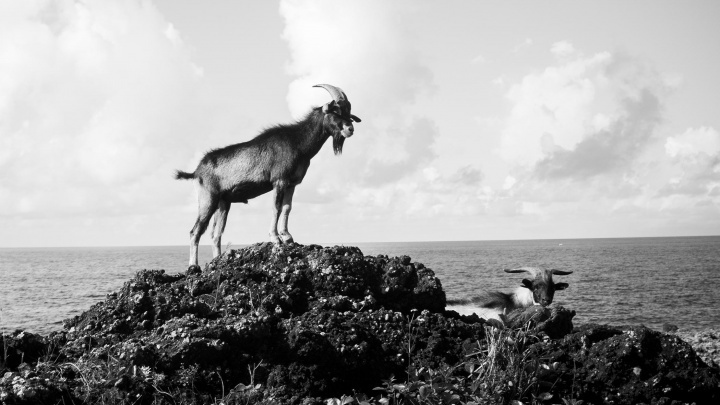 Locals say there is a heavy penalty for anyone who kills a goat. Nonetheless, other locals also told me they had witnessed goats being hunted and shot, despite their supposed sacred status. 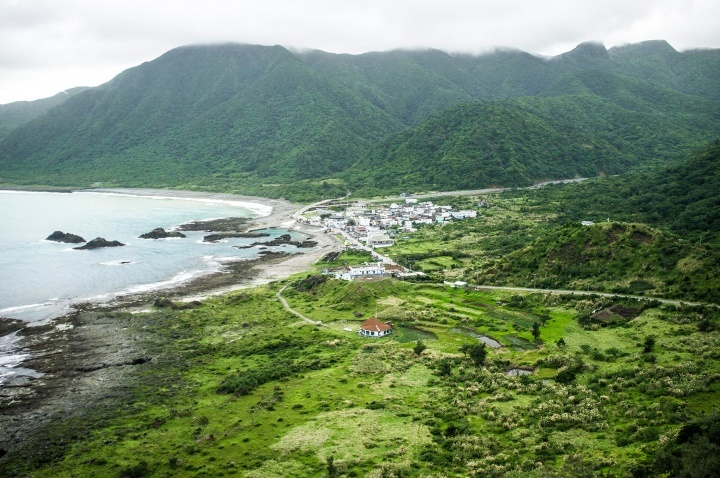 The island is home to the ethnic minority group called the Tao, who migrated to Taiwan, including Lanyu, more than eight centuries ago. 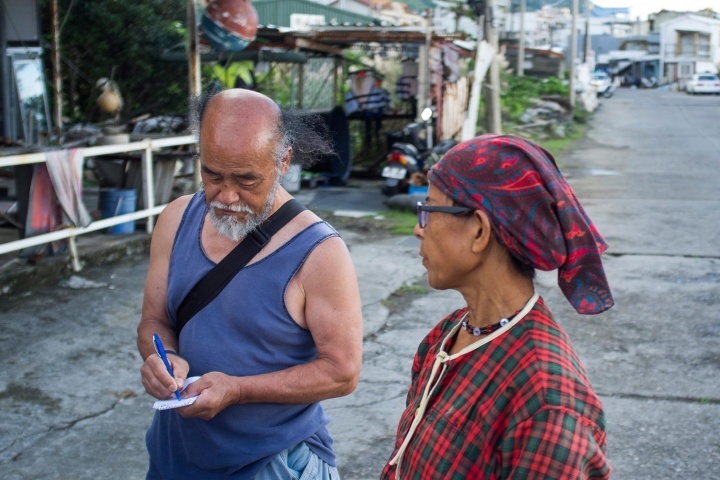 The Tao people are ethnically linked to the inhabitants of other Pacific territories, such as Malaysia, Indonesia and the Philippines. 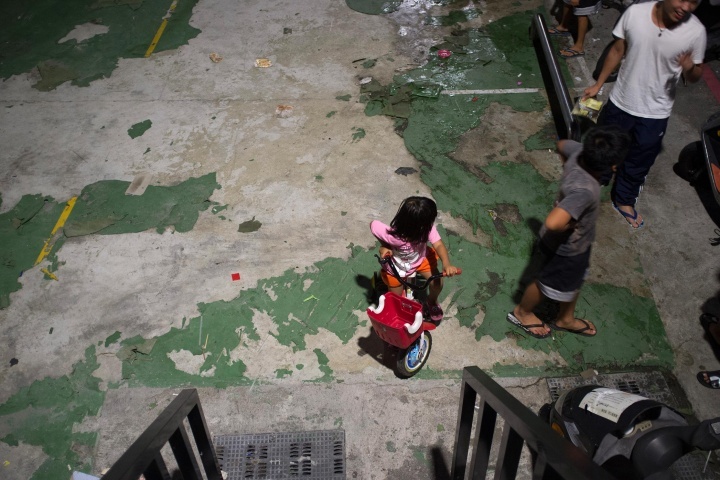 They arrived to Taiwan long before the Han Chinese migrated there from China in the 17th century. 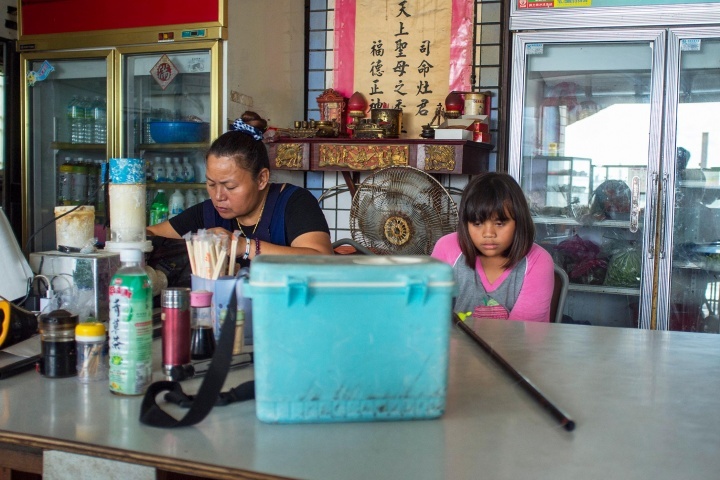 Due to forced submission, assimilation and intermarriage, enforced by the Japanese and Chinese, indigenous groups now only make up around 2 percent of Taiwan’s 23 million people. 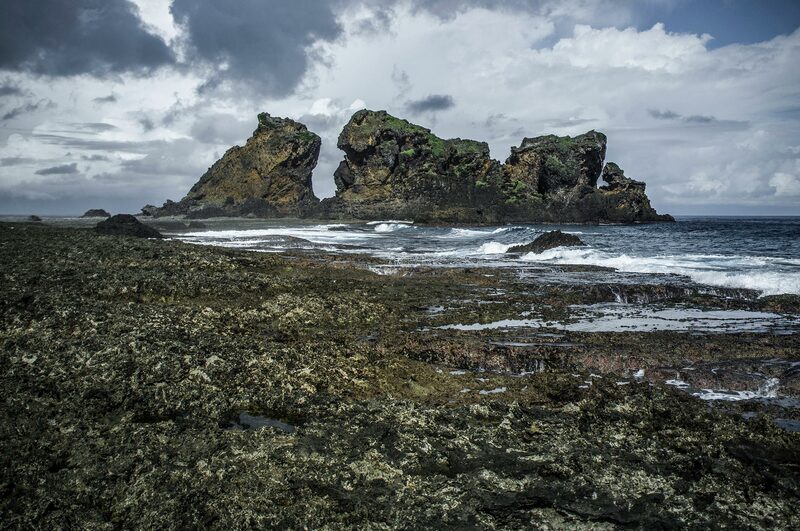 Some of whom live here, on Lanyu. 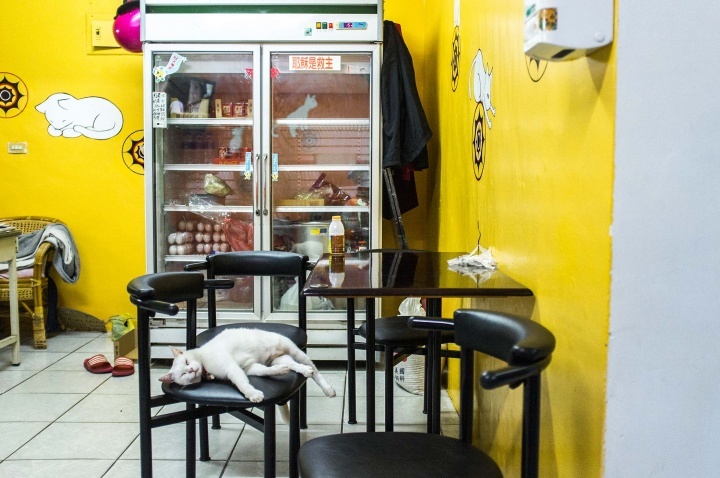 Sleeping cat in an eatery decorated with sleeping cats. 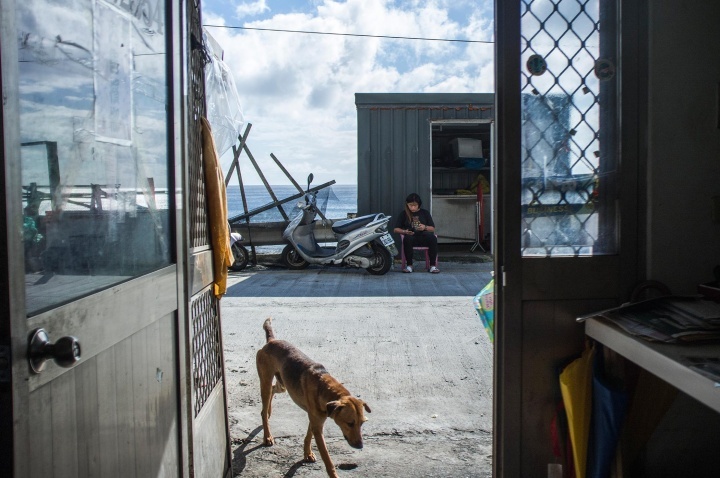 Some locals now work on the mainland, returning to Lanyu on a monthly basis to visit their families. 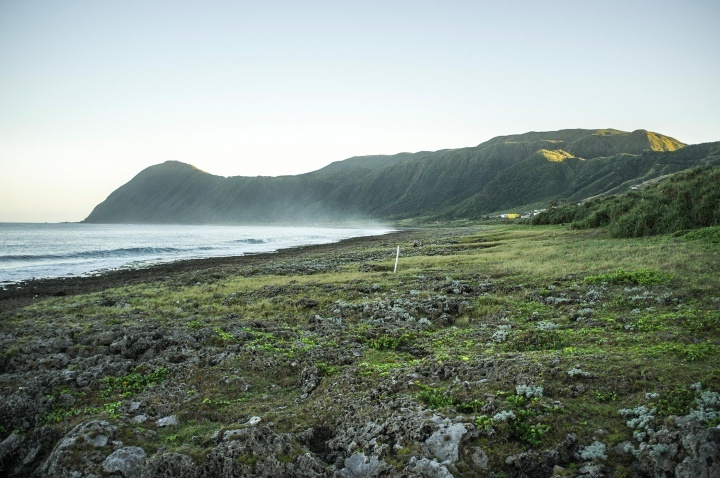 Before the 1970’s Lanyu was deemed an “ethnological research” or forced assimilation area and closed off to the public. The Chinese government eventually lifted the restriction, and the island was opened to the outside world and modernisation. Gradually customs have become diluted and the traditional concept of the tribe changed forever. 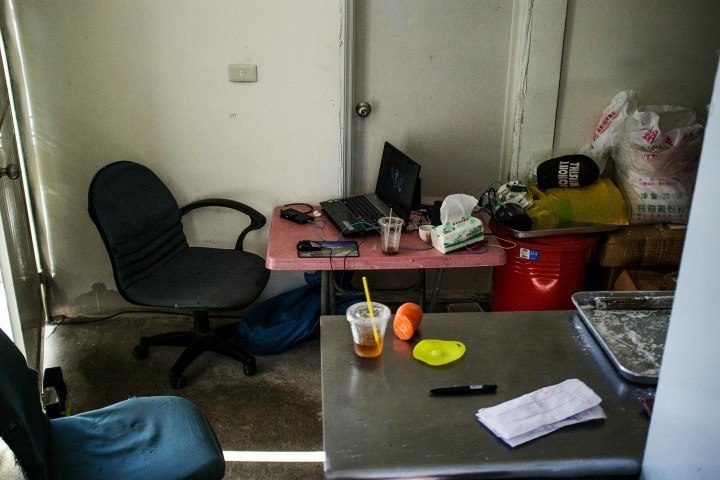 Today almost everyone owns a scooter, TV, cell phone and a fridge, or sometimes two. 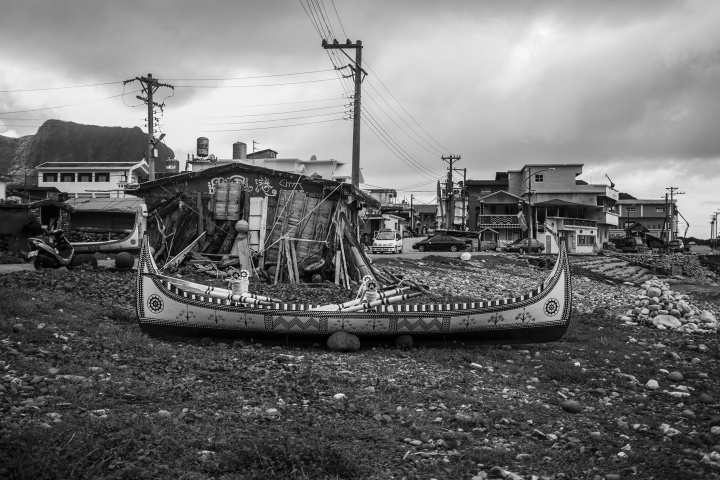 Despite the great number of indigenous people, there are very few traditional dwellings left on the island. A few years before it was opened up to the public again, most traditional homes were torn down to make way for modern public housing. Unfortunately I could only find the ruins of the demolished dwellings. 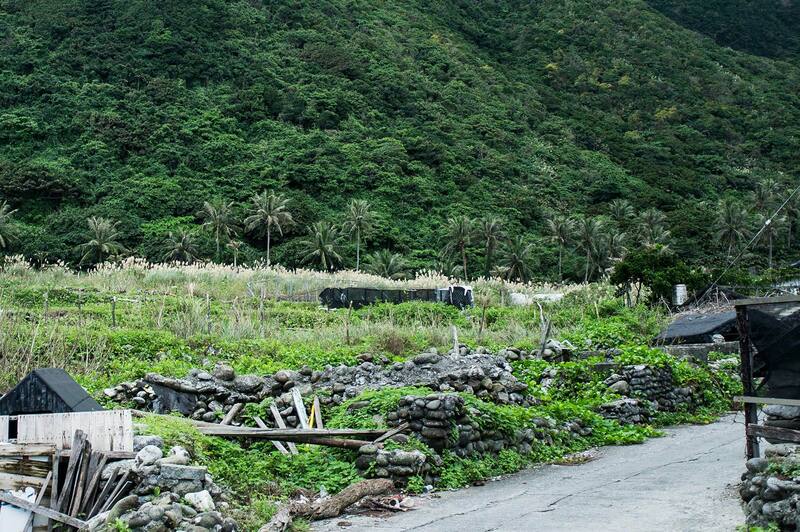 For centuries Tao dwellings were built half-way into the ground to adapt to the island’s climate. The design had the dual benefits of keeping out the cold, strong winds in winter and keeping the house cool in the burning hot summer. 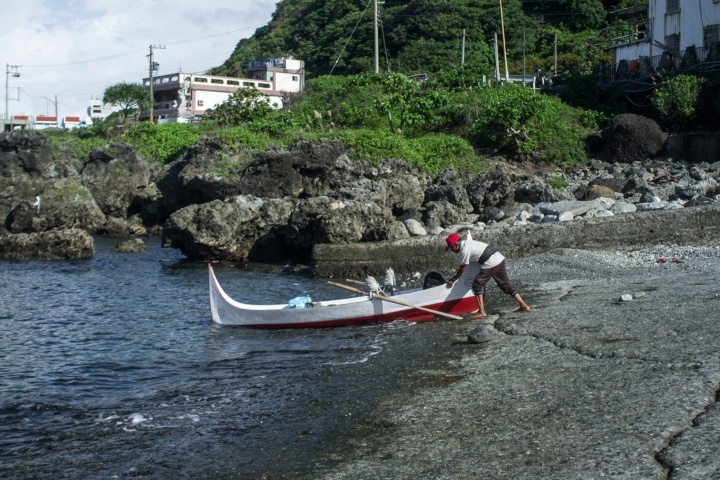 One unique element of indigenous culture that developed and remains on this island is the "flying fish festival." I n early spring, when the seas come alive with the flashing silver sparkles of flying fish, the people begin a series of rites, sacrifices and celebrations. During the festival, the men of the village wear traditional Tao clothing (loincloths), and smear the blood of a freshly killed chicken on the rocks by the sea. Before singing rites and throwing their canoes in the air. The people keep their traditions by also continuing to respect taboos. One of these taboos is to wear clothing with an odd number of stripes. Women viewing the festival or touching the tatala (canoe) are also considered taboos. Unfortunately for me the season had already finished. The island seems like a perfect place, where it’s hard to imagine having any problems. However the truth is hidden away behind its tallest mountains and deep inside its darkest caves. 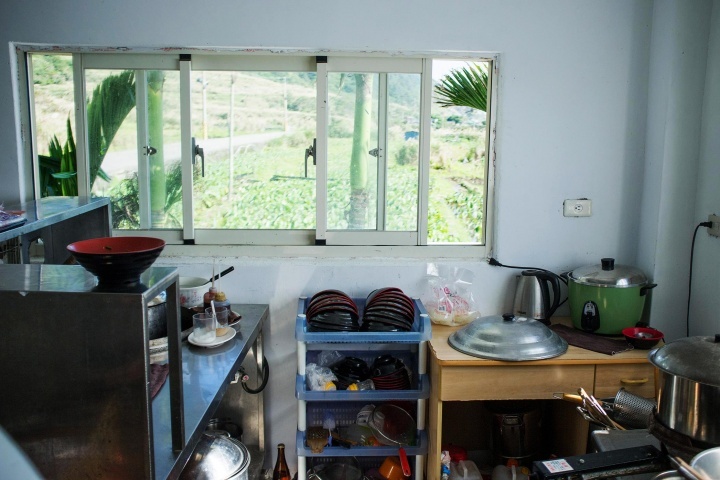 For many years Chinese people were sent to the island in a bid to influence local traditions. Intermarriages took place, blurring the once-clear line of ancestry. 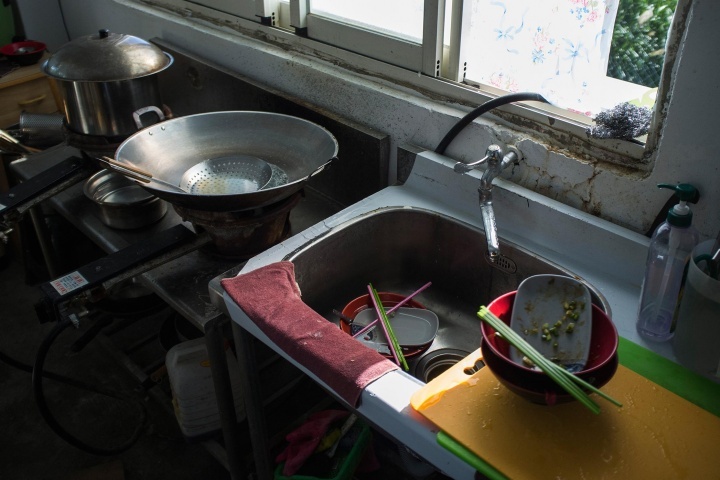 The Tao’s traditional dwellings were banned by the Chinese and demolished to be replaced with concrete buildings. The new, above-ground, design of these structures made them vulnerable to the fearsome typhoons that hit the island each year, and many were destroyed. However, strong seasonal winds and two-storey high waves aren’t a threat to the natives. 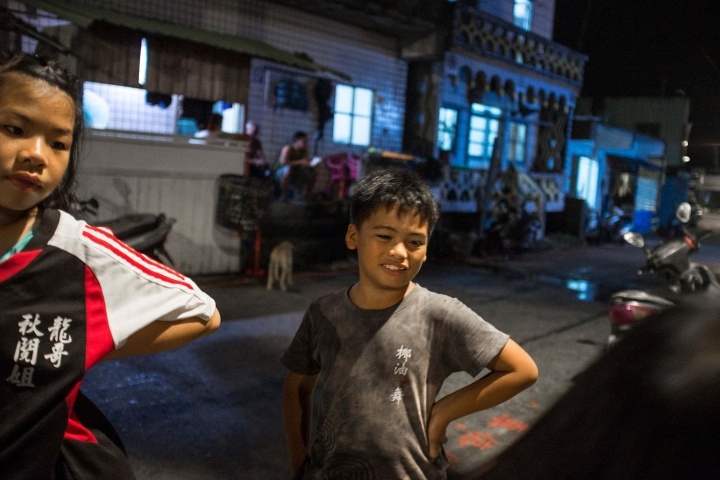 The real danger for them is the loss of their language, traditional values, beliefs and way of life, after decades of repression and assimilation into modern Chinese and Japanese cultures. 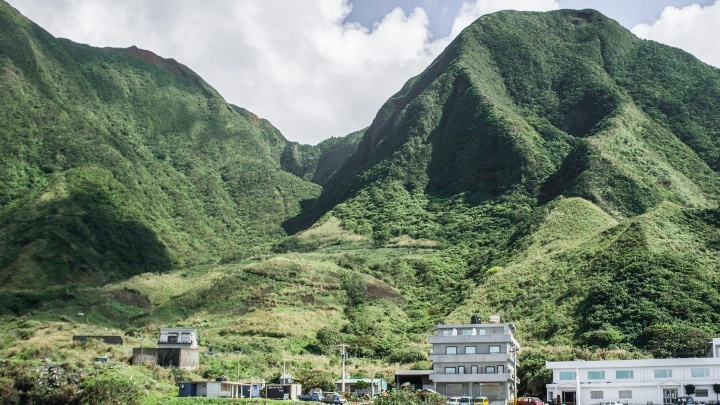 Modernisation is taking its toll, with Lanyu’s estimated Tao population of 3,000 decreasing rapidly, as young men abandon the tradition of wearing loincloths in favour of jeans and leave the island in search of successful careers. 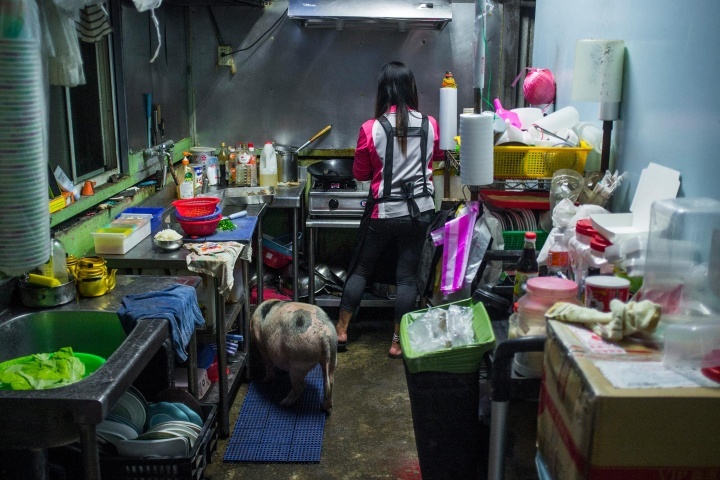 On the upside, despite the government’s assimilation efforts, the Tao have been more successful than any other Taiwanese aboriginal group in preserving their established ways of life. One traditional practice that is here to stay is the building of handmade wooden canoes. The indigenous people now face other challenges, such as forced eviction from their land, tourism development and nuclear waste disposal. 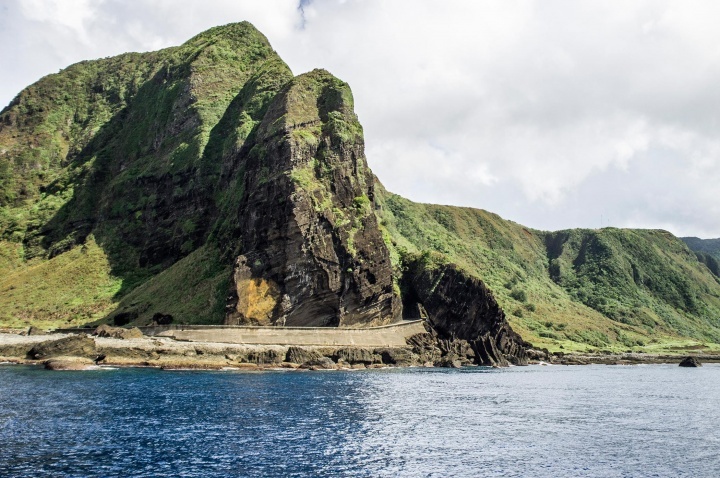 It’s ironic that Lanyu is free from air and sea pollution, yet on the south of the island stands a nuclear waste storage facility, where the Taiwanese dispose of nuclear waste from three power plants. This issue has led to continuous protests but has never been resolved. While the government searches for ways to get rid of its nuclear waste, Tao children are being born into a radiation-filled environment. After spending a few days here, eventually my time came to an end. My first flight got cancelled due to the island’s typhoon winds, but on the next day the weather was perfect. Sadly. When the plane took off and soared over the ocean below, I suddenly remembered how thousands of flying fish and dolphins had appeared as we arrived. Surrounding the boat and seeming to show the way, gliding and glittering before they eventually disappeared beneath the glowing white sun.